depending on the replication factor defined when creating the database. so we still have a copy of the data when a node goes down. The Database Group refers to all the database instances in the cluster. and is able to serve all queries, operations and write requests. The Database Group Topology is the specification of nodes that contain the database in the cluster in a particular point in time. At the Database Group Level, all the nodes are working cooperatively together. The connections between the databases on the different nodes do not go through any consensus protocol. Instead of selecting a leader, as in the Cluster Level, there is a direct TCP connection among the various nodes that hold a particular database. Whenever there is a write on one of the databases instances, it will immediately be recorded and replicated (sent) to all the other nodes in the Database Group. Note 1: If the database instance is unable to replicate the data for some reason, it will still accept that data and send it later. Note 2: Although not all nodes in the cluster belong to the Database Group, each node in the cluster has a full copy of all Database Group Topologies. List of nodes that are in the Database Group Topology. In this example, database db1 exists on nodes: A, B, C, D, and E as well. Note: There are other nodes defined in the cluster but they do not belong to this database group. Tasks for which a node is responsible for. i.e. Node 'A' is responsible for an 'External Replication Task'. A node is marked as Rehab if it is down or unreachable. This is the responsible node that will update the Rehabed node once its up again. Once Node 'E' will be up again, Node 'A' will update the database instance on 'E' with all changes that occurred while it was down. The order of the nodes is relevant for the client, as it selects which node to contact from this list. Click this button to reorder the nodes order. Soft Delete: The physical file will be kept on the removed node's disk. Hard Delete: All database files are deleted on this removed node. No more replication will occur from the other nodes to this node that is removed. 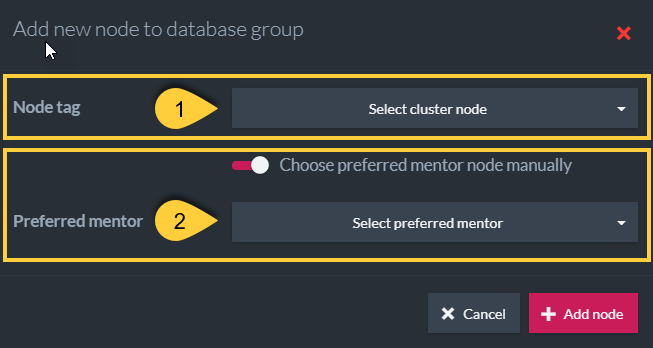 Check the 'Choose preferred mentor node manually' checkbox in order to specify which node will be the preferred mentor for the newly added node. If not checked, then any one of the already existing Member nodes in the group will become the mentor node. it will be promoted to a full Member. i.e. external replication, subscriptions, ETL Replication, Backups, etc. Who's Duty is it ? Topology changes (i.e. 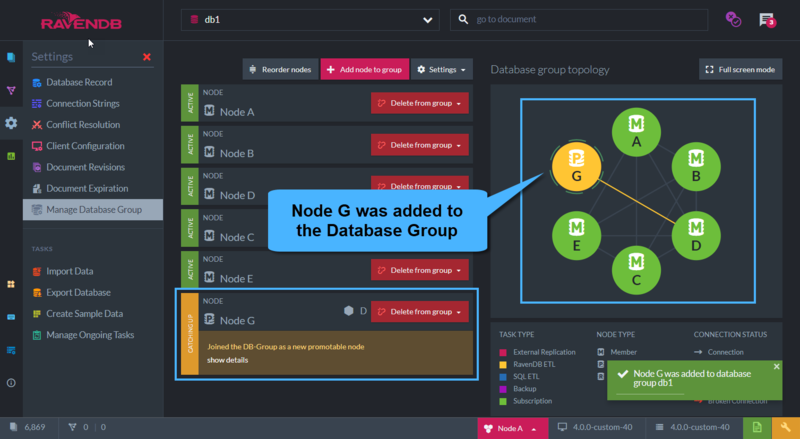 new node in the database group, delete node from Database Group), as well as tasks that are defined on the database, are written to the Database Record. 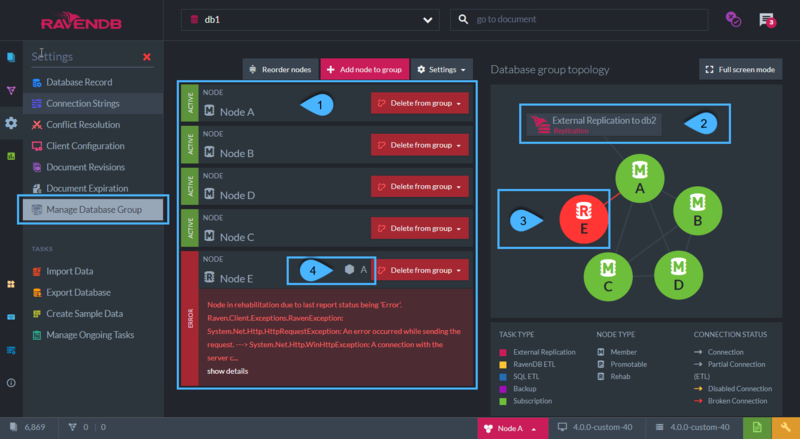 The database record exists in each node in the cluster. 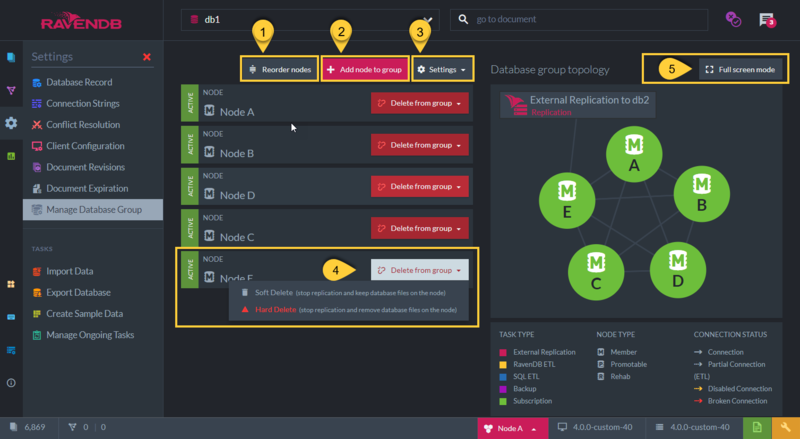 each node in the Database Group checks the Database Record and determines (based on a pre-defined algorithm) if it is the task owner.